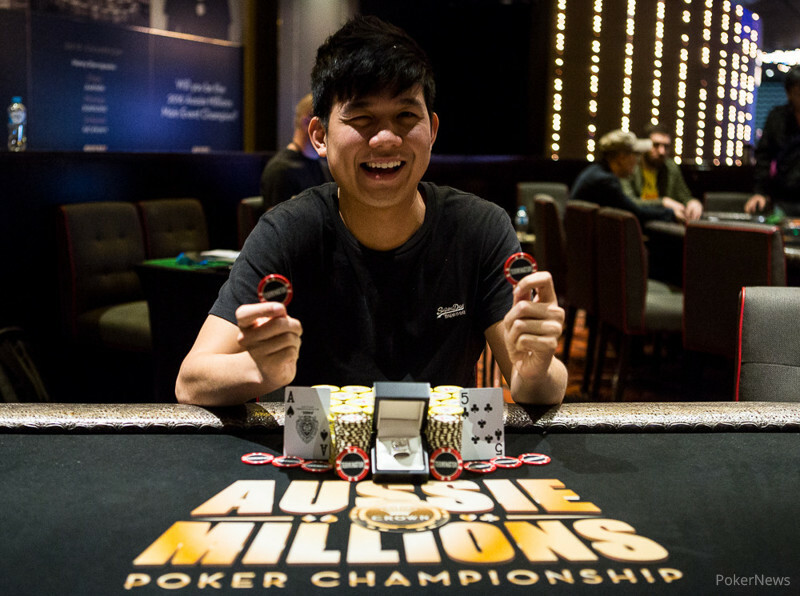 Singapore's Alex Lee took down the 2016 Aussie Millions Event #13 $1,150 Terminator No-Limit Hold'em title at the Crown Poker Room Monday, running away with the final table at the end to capture the event's $39,000 first-place prize, and an LK Boutique Aussie Millions championship ring. Lee also collected 10 bounties for another $5,000 on the way to defeating a 316-player field over the past two days. The event's final day kicked off just after 1 p.m. local time Monday with 21 remaining, and moved to a final table of ten within two 40-minute levels. Stewart Davidson was the first player to exit the big stage, getting his aces cracked to bow out tenth. Michael Tchong was eliminated in ninth before last woman standing Samantha Abernathy took out both Sam Vakili and Don Mishra. Aussie Mark Payne had the lead, but Lee crept up close busting Robert Spano sixth and Reece Webb fifth. 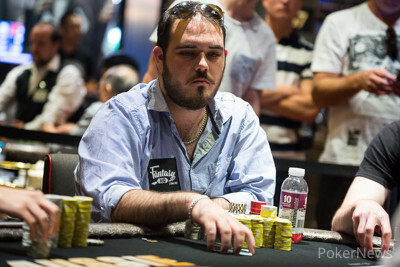 Play went three-handed with Payne still in charge when he dispatched Michael Fraser. Lee was actually the shortest of the three, but soon doubled into the lead, four-bet shoving with a big ace and catching against Payne's pocket fives. Lee simply crushed his two opponent's after that, winning every big pot and putting the pressure on at every turn. 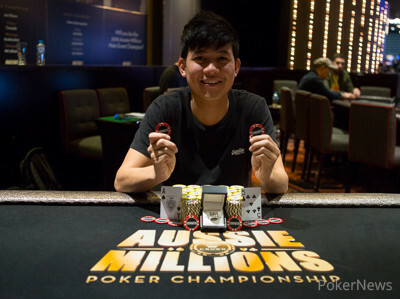 In the end, Abernathy got it in bad against him and couldn't find a way out to bust third and Lee beat Payne in one hand of heads-up play, catching a pair with his dominating ace, to capture his first Aussie Millions title. The heads up duel took all but one hand and it was a battle of the ace rags that put Mark Payne at risk with the slightly worse kicker. 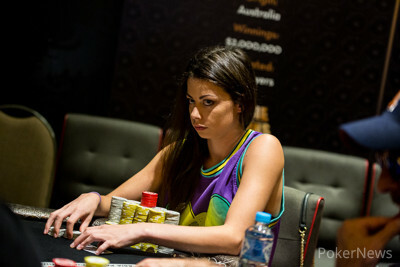 A likely split pot was foreseen on the flop , whereas the turn was a bad card for Payne. Lee locked up victory with the river and sent his opponent to the payout desk to collect A$24,885. The flop changed nothing whatsoever, whereas the turn put Abernathy into the lead. It was the river that restored the preflop order and sent Abernathy to the rail in 3rd place for a payday of A$15,760. Alex Lee has a wall of chips in front of him comparable in size to the great one in China. He's also pounding away on his two opponents with a wave of relentless aggression. One good example of how things are going three-handed came when Mark Payne made it 48,000 from the button and Samantha Abernathy called in the small blind. Lee defended his big blind, and when Abernathy checked the flop, Lee simply pushed all in. Payne and Abernathy folded and the beating continued. Samanthy Abernathy raised to 48,000 from the button and Alex Lee three-bet to 112,000 from the button, getting called by Abernathy. On the flop , Lee fired a bet of 78,000 and was called before making it 95,000 on the turn. Abernathy called again and then gave up when facing a third barrel on the river. Lee then raised to 48,000 and Abernathy called. On the flop both checked. Abernathy bet the turn for 55,000 and Lee called before both checked the river. Abernathy showed for a bluff and Lee scooped the pot with the . Mark Payne is sliding fast. First he paid off Alex Lee's two pair, then Samantha Abernathy's top pair. Finally, he three-bet to 128,000 over a Lee 48,000-chip open, only to fold when Lee fired in a stack of brown, four-betting to 648,000. Lee flopped top two on and held onto the lead with the turn and river completing the board. On the heads-up flop of , Andy Lee bet 55,000 out of the big blind and Mark Payne called. The turn was Lee worth a bet of 88,000 and again Payne called before doing so again for the very same amount once the appeared on the river. Payne flipped over the for a busted flush draw and pair of fours, which was good enough to win the pot. Lee got through with a three-bet preflop, but then folded the flop when betting 50,000 and facing the all in of Payne.